Naidoo’s research focuses on modifying the shape of a laser beam inside a laser cavity. Laser beam shaping makes it possible to improve the efficiency of laser-based applications in industry, medicine and communications. Naidoo’s research focuses on intra-cavity laser beam shaping for the generation of transverse higher-order modes in solid-state laser resonators toward high brightness solid-state lasers. High-brightness lasers, particular of the solid-state design, are of considerable interest in industry, the military and academia, and have been exploited in remote sensing, ultrafast spectroscopy, laser-precision materials processing and laser weapons applications. In each of these applications, a specific intensity distribution needs to be achieved. Members of his research team have explored two techniques in laser beam shaping, namely pump shaping and intra-cavity beam shaping. These techniques were implemented in a microchip laser and in solid-state laser cavities, where a pure vortex beam, vector vortex beams, flat-top beams and pure superpositions of vortex and/or vector vortex beams were obtained. Coupled to the beam shaping, his team was the first to demonstrate the intra-cavity metamorphosis of a Gaussian beam to a flat-top distribution through the use of two refractive optical elements and the intra-cavity selection of pure vector vortex beams as represented on a higher-order Poincaré sphere, where the quality of the work was highlighted through publication in Nature Photonics. 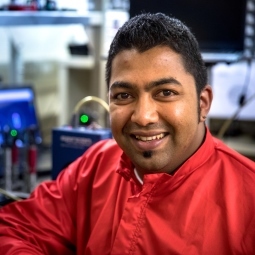 In his research, Naidoo constructs various optical experiments, which range from solid-state lasers, to microchip lasers and extra-cavity beam shaping experiments through the use of a spatial light modulator. Naidoo has spent time in laboratories in France and Germany. His research has allowed him to supervise undergraduate and postgraduate students. Naidoo has received numerous grants and awards for his work.